It takes a big effort (and a little luck) getting to the Skelligs. But proper planning makes for an unforgettable pay-off. There was a 70pc chance of rain. Boats hadn't sailed the previous week. I arrived in Kerry to slumberdown skies, hulking greyly over everything. My second attempt at visiting Skellig Michael, 13km offshore in the maritime mulch, was looking inauspicious, to say the least. When I woke up the following morning, however, I opened the curtains to what could have been a Fáilte Ireland ad. The skies were blue. The water was glistening. The boatmen were hustling at the pier. An hour later, I was pulling on a borrowed set of oilskins, on my way to the ultimate UNESCO World Heritage Site. Unless you've been living under a rock, you'll know the Skelligs feature in Star Wars: The Force Awakens (2015) and The Last Jedi (December 15). The rocks look outrageously good on screen, and guides are regularly seeing visitors whipping out lightsabers and Jedi cloaks for selfies. But here's the thing. Though Star Wars has shot it into the spotlight, by the time you cross the heaving seas, climb the 618 steps, wonder at the psychadelically-beaked puffins and emerge to the cluster of beehive huts overlooking the Atlantic, Luke and Rey seem kind of irrelevant. It's jaw-dropping. Why did the monks come here? How did they survive the inclement weather? The wind buffets you on precarious paths ('Please take care, as fatalities have occurred,' a sign warns). Headstones are ravaged, and it's pure chance as to whether you'll be caked in rain or fog or treated to resplendent sunshine. It feels like a galaxy far, far away, but it's tantalisingly close to home. 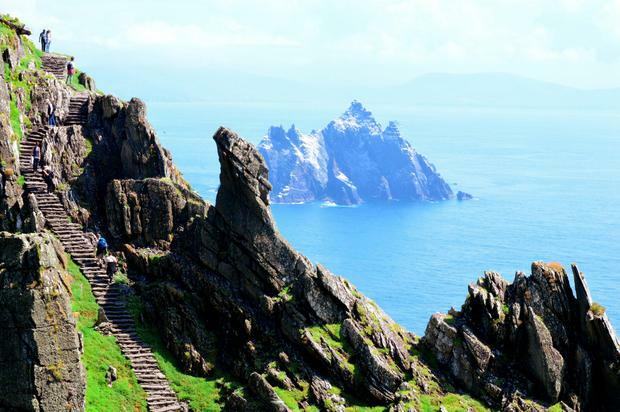 Skellig Michael's 600 steps. Photo courtesy of Fáilte Ireland. Boats to the Skelligs cost from around €60 for landing trips. Star Wars fever, a short season (May-October) and limited visitor numbers (some 180 tourists each day) means seats are at a premium, so book ahead. See the OPW's official website here for the latest details. Boat trips are weather-dependent, with decisions made based on sea conditions on the morning of travel. Even when trips go ahead, the crossings can be rough - so think twice before wolfing down that Full Irish breakfast an hour before your trip. Some passengers do cancel, or fail to show, so it can be worth pitching up in the morning to try for tickets - but don't depend on this. Trips last from around 9.30am to 3.30pm, and there are no toilets or shelter on the rock - so bring sunscreen, layers, waterproofs and food (watch out for sniping gulls, though). It's a good idea to bring a backpack, so your hands are free on the uneven steps. Skellig Michael is a wilderness site. If you feel the climb may be a challenge, or have medical conditions that could be a concern, think seriously before you travel. There are OPW guides on the Skelligs who give a short spiel on the UNESCO World Heritage Site - don't be shy with the questions; they're a mine of information. Have a Plan B in case of cancellation: Valentia Island, the Skelligs Chocolate Factory (skelligschocolate.com), Kerry Dark Sky Reserve and Ring of Skellig drive are all under-rated attractions off the traditional Ring of Kerry loop. The Skellig Experience on Valentia Island (skelligexperience.com; €5/3) offers some super insights into the history, wildlife, lighthouses and birds of the Skelligs, whether or not you make the islands themselves. Boats go to the Skelligs from Caherdaniel, Ballinskelligs and Valentia, but Portmagee is the main taxi stand. The Moorings (moorings.ie), run by Gerard and Patricia Kennedy, is just yards from the harbour, with a two-night Skelligs package including B&B, an evening meal and more from €160pp in peak season. The Moorings also has a Star Wars package, bundling two nights' B&B with the opportunity to pull your own pint in the same bar as Luke Skywalker (AKA Mark Hamill) and a T-shirt ('May the craic be with you!') from €149pps. NB: Prices subject to availability. Some information, such as the boatmen licensed to operate in a given year, may be subject to change.